Scribblers' Rest: Scribblers' Rest: Episode 25 - Pathfinder - Rappan Athuk! : – What's Up Adrik? Scribblers' Rest: Episode 25 - Pathfinder - Rappan Athuk! : – What's Up Adrik? Welcome to Scribblers' Rest, where a group of Florida creatives play RPGs! 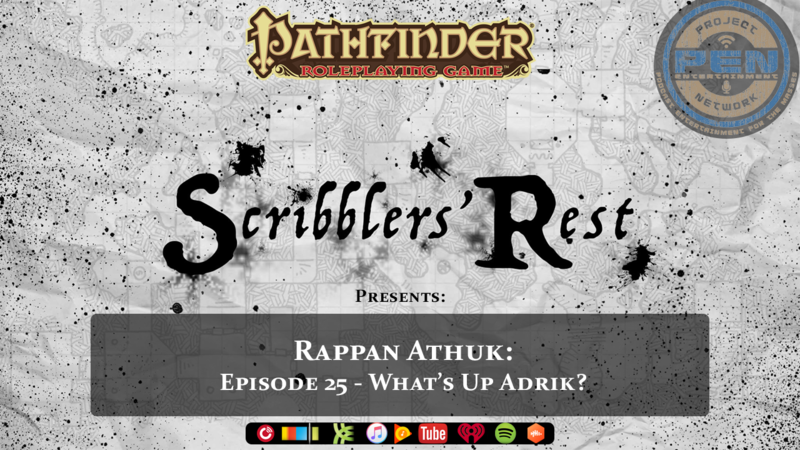 The Scribblers get real as they venture head first into Rappan Athuk: Episode 25 – What’s Up Adrik? Adventuring can be rough, but friends can be made. With Adrik by their side, the party leaps into the Frog God’s temple. Who needs to knock? We play role-playing games such as: Dungeons & Dragons, Pathfinder, and Shadowrun. Music by Michael R. Fletcher (also a kickass author) and the Doppels Band! Thank you to Project Entertainment Network and Armand Rosamilia (another amazing author/podcaster) for hosting our show! Thank you to Frog God Games. The Scribblers’ Rest podcast is hosted by authors Brian Downes, LJ Heydorn, and William Tucker. We invite creative types (authors, artist, cosplayers, etc) to join our motley crew and venture forth with us. We drag our fearless adventurers through the tabletop role-playing worlds of Pathfinder, Dungeons & Dragons, Shadowrun, and much more.